A modern retreat that embodies its owners fondest memories of Belgrade’s Great Pond. Our Maine Homes editor has combed through the real estate listings and picked some of her favorites. The secret to distinctive decor is knowing how to pull off a hodgepodge, says Erin Kiley of Portland Flea-for-All. Click to learn which items are currently flying off the floor at the Flea and how you can use them to create your own enviable, eclectic schemes. Would you like to hibernate here for the winter? See more cozy cabins from Sarah’s visit to Toddy Pond. A Maine Homes by Down East house tour in Cornish, with picturesque Main Street and several beautiful old homes arrayed in the foothills of the White Mountains. Six years ago, Ross and Christine Endicott stopped selling furniture containing toxic chemicals; now the state is following their lead. Downsizers carve out space for themselves — and their collection — in 1,200 square feet. Owners of an Eisenhower-era ranch discover what’s old is cool again. 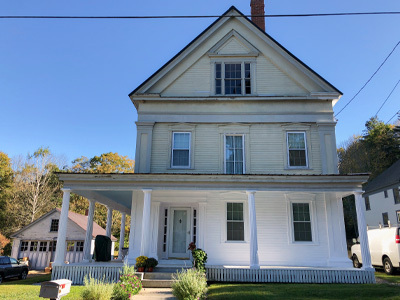 What are your favorite Maine streets/towns for ogling old houses? See some of the glorious old houses along Main Street in Orono.